【Ultra-thin & Portable Design】: The thickness of light pad is only 8mm, 38 * 38cm/15 * 15in overall size, easy to carry and store. The light pad adopts environmentally-friendly material, good heat dissipation, Strong flame retardancy, safer to use. 【Stepless Brightness Control】: Stepless dimming, only need to touch the button to adjust LED light until you get the required brightness you want, super bright without flickering, the light is eye-protecting, uniform light-emitting, no harm to your eyes, especially working in long hours. This is a shadowless lamp, very suitable for use in dark environment and low lighting outdoor activities. 【Simple operation】: Just insert the plug & turn it on, A4 or A5 paper can be placed on the surface of light pad, then you can start your creative work. This is copyboard, drawing board, children painting board, writing practice board, sketchpad, it can as a creative gift toy for Halloween Christmas Birthday and other traditional festivals, suitable for 4,5,6,7,8,9,10,11,12,13,14,15 years old boys and girls. 【Wide Application】: Can be used for sketching, drawing, 2D animation, calligraphy, stenciling, architecture and clothing design, diamond painting, tattoo transferring, X-ray viewing and so on. 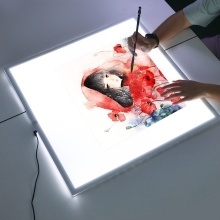 You can put the photos, posters, embroidery, insects, color stones on the light pad for viewing. A perfect gift for artists, animators, designers, art enthusiasts, children, students.